02 Nov 2018 --- Climate change is set to reduce the nutritional quality of one of the world’s major staple crops, the common bean, new research has unveiled. Published in Nature Scientific Reports, the analysis shows that by 2050, future bean servings will have lower nutritional quality, posing challenges for ongoing climate-proofing of bean production for yields, nutritional quality, human health and food security. The research was conducted between Malawi and Ireland as a collaboration between NUI Galway, the CGIAR Research Program on Climate Change, Agriculture and Food Security (CCAFS) and the International Center for Tropical Agriculture (CIAT). The researchers are now highlighting the need for accelerated development and seed-system distribution of heat-tolerant and drought-tolerant common bean varieties, using techniques such as biofortification. Using crop simulation modeling, combined with field trials and molecular laboratory experiments to analyze the yields and the nutritional quality of the crop, the researchers found that the majority of current common bean growing in areas in southeastern Africa will become unsuitable for bean cultivation by the year 2050 due to conditions such as drought. They also demonstrated reductions in yields of common bean varieties in field trial experiments at a research site that was representative of future predicted drought conditions. 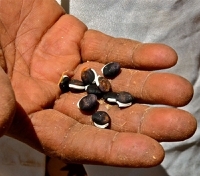 The nutritional analysis of the different common bean varieties, grown under the level of drought stress that will occur due to climate, revealed that essential micronutrients for human health, such as iron, were reduced in all of the bean varieties, while anti-nutritional compounds such as phytic acid and lead were increased. “Given that diets in Africa rely significantly on plants, there is major cause for concern if climate change leads to lower levels of essential nutrients such as protein, iron and zinc in our diets by 2050. Such loss of dietary nutrients in foods will further aggravate the nutritional deficiency experienced by hundreds of millions of people, particularly the poorest in developing countries in Asia and Africa,” says Dr. Andy Jarvis, from the CGIAR Research Program on Climate Change, Agriculture and Food Security. “Our research, and recent research by other groups, is generating an emerging body of evidence that climate change will reduce the nutritional quality of many of the world’s staple crops. This is due to the effects of rising temperatures, reduced rainfall and rising CO2 levels on the nutritional composition of the crop-derived foods that underpin global food security and human health,” says lead scientist of the study, Professor Charles Spillane, Director of the Ryan Institute at NUI Galway. Significant investment is needed to climate-proof crops and cropping systems so that both their yields and nutritional quality can be resilient to future climate change stresses, he adds, particularly since it takes decades to develop and disseminate new crop varieties. The research results come after the release of a report by the Institute for the Future and the Bill & Melinda Gates Foundation, entitled Good Food is Good Business, which encapsulates strategies for food companies to combine emerging technologies, such as artificial intelligence and synthetic biology, with established production strategies and traditional food wisdom to produce affordable and nutritious food. Speaking on the potential role of the food and beverage industry in fighting micronutrient malnutrition – which affects more than 2 billion people in the world today – Spillane underscores the need for further efforts in the area of biofortification. “For consumers whose nutritional needs are being delivered by the food and beverage industry, the industry can (and does) engage in food fortification involving the addition of micronutrients to processed foods. However, there are significant millions of people whose food and nutrition security does not come from the formal food and beverage industry, largely due to a lack of purchasing power and access to markets,” Spillane tells NutritionInsight. “Our results highlight the need for accelerated development and seed-system distribution of heat-tolerant and drought-tolerant common bean varieties that can maintain yields while also improving nutritional quality, for example, through genetic ‘biofortification’ breeding under future climate change scenarios,” Spillane explains. For the poorest in society (particularly in rural areas) who suffer from micronutrient malnutrition, the breeding and supply of micronutrient-dense staple crops can be an effective route to reaching these people and communities, Spillane notes. The further development of biofortification is not without challenges, however. As Spillane points out, in many developing countries, the public and private sector systems for delivering new seeds (varieties) to more impoverished farmers are ineffective, making it a challenge to get biofortified crop varieties to the rural poor. “The food and beverage industry could consider the financing of programs for the breeding of micronutrient-dense staple crops of the poor as a component of their corporate social responsibility and commitments to Sustainable Development Goal SDG2 (Zero Hunger) and the SDG aspiration of leaving no-one behind,” he concludes.